The Young Elites is my first Marie Lu book. I've been meaning to read her books for years. My husband loved the entire Legend series, but I never got around to it. I was fortunate enough to get a review copy of The Young Elites and used that as my opportunity to finally get to Marie's books. If the Legend series is as good as The Young Elites, I definitely need to read it! Although this book is told from the perspectives of three characters, Adelina is clearly the focus. The book begins with her pending burning at the stake by the government both for being a malfetto and also for an accident her powers caused. As one might expect, she doesn't actually die in the first chapter - she ends up with a group of rogue malfettos bent on ending the malfetto stigma and overtaking the government. This group is led by the handsome Enzo. But the inquisition, led by Teren is only a few steps behind. My first concern of featuring a girl and two boys was the inevitable love triangle. Fear not, there is no love triangle. Nor are there any hints of one developing in the future (although I still wouldn't be too surprised). In this book, Enzo is the handsome, charismatic leader that Adelina admires and Teren is her cunning, cruel blackmailer. One thing I particularly like about the story is that none of the three characters are entirely good or bad. Adelina is the closest to being pure good. She has lived a life of loveless torture under her father while her spoiled younger sister stood to the side watching. Still, she will do anything to protect Violetta. She wants to be accepted, but most of all she wants to survive. On the other hand, Adelina has a lust for power. With her newfound powers and her ambition, I think she may have a capability for cruelty that even she does not realize yet. As for the boys, Enzo is the obvious hero and Teren is the obvious villain. But both are equally arrogant, vain, and ambitious. Both are charismatic and influential in their own ways. Even Teren, whose daily purpose is to destroy the malfettos, has reasons for what he does that are somewhat understandable. Just like Adelina, neither character is all good or all bad. Which just makes me want to keep reading to get to know them better. There are a number of side characters, only two of whom (possibly three) seemed well-developed. My favorite was Raffaele, who serves as Adelina's daily trainer and protector. He introduces her to life among the Young Elites and is the rock she leans on. However, he is a consort, accustomed to charming and hiding his feelings. I loved him, but also questioned early on whether Adelina should trust him. Adelina's sister Violetta is a beautiful, pampered weak child who watched Adelina be abused for years without comment. She seems like a character easy to hate, but Adelina loved her (and hated her a bit too). I came to do the same. The possible third is the queen, who we don't get to know well. She's a delightfully campy villain. She lusts for power and for everything else. She thinks she's the smartest person in the land, but she probably is not. You can tell that this book is the first in a series. It has a cohesive story with an exciting plot and it does not end in a cliff-hanger. However, I couldn't shake the feeling that a lot of it was set up. Especially the boys. We get to know them in this book, but only at a surface level. I have no doubt that their stories and relationship with Adelina will change greatly as the series goes on. 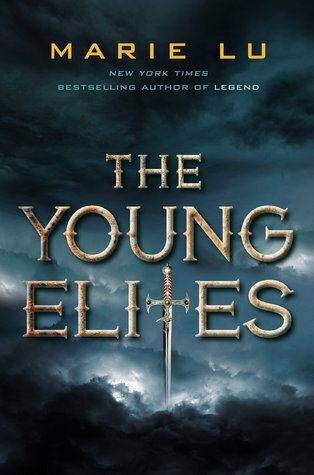 The Young Elites is a wonderful first book in a series. The strong world building, well developed characters, and readable plot kept me glued to the pages. With its constant excitement and quasi-medieval setting, it's a win for anyone who loves thrillers and/or high fantasy. Great review! I haven't read Marie Lu yet but now I'm excited to. I love that there will be two male POV's without a love triangle. That's just sounds refreshing and awesome! Glad you liked it! I didn't really care for the Legend series. I'm a bit burnout from the dystopian genre to be honest. I do like the sound of this one and it reminds a lot of the Xmen. So glad I bought this! Lovely review! I've been wanting to read her Legends series too, as well as this one after your review!